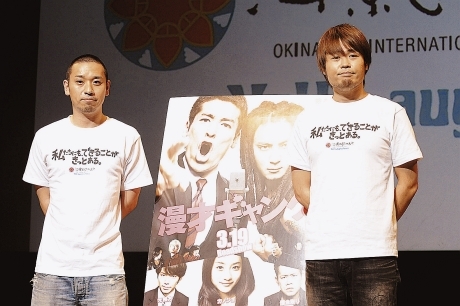 The opening ceremony of the 3rd International Okinawa Film Festival, sponsored by the Festival Executive Committee, was held at Ginowan Tropical Beach in Okinawa, on March 23. Held under the banner: “Yell to support, Laugh and Peace,” the event was designed to raise money for the victims of the huge earthquake and tsunami that struck Tohoku in mainland Japan. At the opening ceremony, the audience, performers and distinguished guests paid their respects to those who lost their lives with a minute’s silence. Proceeds from the sale of various characters goods and other money raised during the Festival will be donated to the people of the areas affected by the disaster through the Red Cross. Prior to the opening ceremony, dressed in matching T-shirts printed with the words: “There will be something that we can do,” actresses and comedians from all over the country, and from abroad, walked along a 300-meter long red carpet onto the stage. The celebrities responded with smiles to cheering from the large crowd that gathered despite light rain falling.